The article reproduced below is obviously written from the viewpoint of a proud American journalist at a time when such propaganda led publicity was vital to a war effort. From a British standpoint, it could not unreasonably be argued that the greater part of the design of this excellent rifle, here given such acclaim, should perhaps not be entirely laid at the door of the Springfield Armoury. Indeed, a Mauser styled front-locking action was employed in the original Enfield design, allied to what would have been a new small calibre British service round. In its original Pattern 1913 "off the drawing board" configuration, the rifle was trialled in the proposed calibre of .276". This new high velocity ammunition fared badly in the rifle, with the higher burn pressures bringing various problems resulting particularly in extraction difficulties. The onset of the First World War meant that Britain urgently needed rifles that could utilise current stocks of ammunition. British production was committed to the SMLE (Rifle, Short,Magazine Lee-Enfield Rifle; and there was initially insufficient capacity for even these, let alone tooling up for a completely new rifle. The United States Government fortunately undertook to manufacture a hurriedly modified version of the rifle for British forces in their .303"calibre. This rifle became the Pattern '14, and latterly, in 1926, gained the nomenclature Lee-Enfield Rifle No.3 . More than a million were exported to the U.K. and put into sterling service.. When the U.S. Government entered the Great War, partly because of the German submarine activity off their Eastern Seaboard, and ostensibly after the sinking of the American passenger steamer "Lusitania" by a German submarine off the coast of Ireland in May 1915. In fact, the passenger list was barely 50% of the norm, and the ship was almost certainly carrying arms and munitions for the British war effort; perhaps even early consignments of the new rifle. 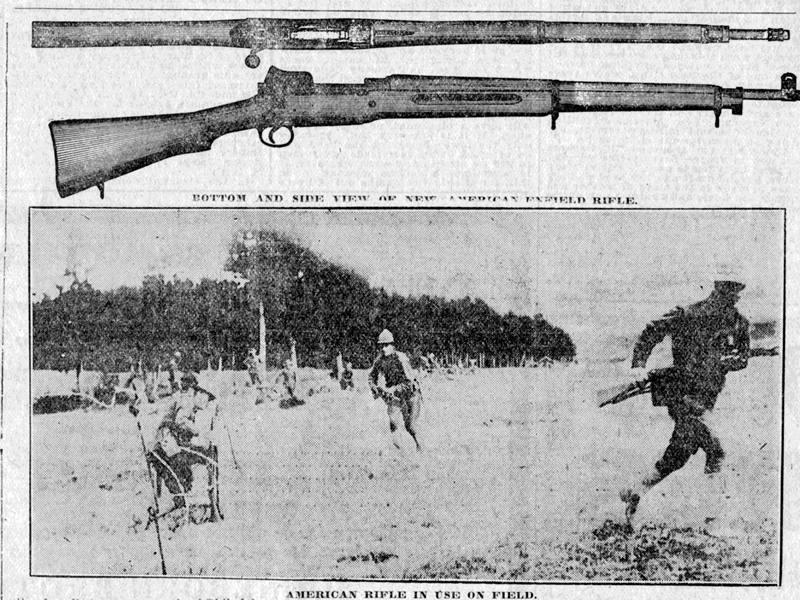 Prior to the commencement of active U.S. involvement in th conflict just under two years later, the American stocks of their Springfield rifle of 1903 themselves required bolstering. The modification of the U.S. manufactured Enfield designed Pattern '14 rifle to the U.S. .30-06" calibre was the obvious answer, and thus was born the American Enfield Pattern Rifle of 1917, of which at least 2.5 millionwere produced and carried by U.S. troops in the latter half of the Great War. The thankful ending of the "War to end all Wars" was not the end of the story for the American Enfield and its British counterpart, the Pattern '14 rifle. The rifle's inherent accuracy brought both rifles into the realms of target shooting between the Wars and continued even after the Second World War post-1945 at Bisley in particular. however, 1919 did not see their last employment in battle. So short of rifles were British forces, at the outbreak of WW11 in 1939, that these rifles yet again saw service in combat in Europe. The non-standard calibre of the U.S. Pattern 1917 rifles that remained on this side of the Atlantic after WW1, led to stocks being issued to the home defense organisation, where large quantities of ammunition were unlikely to be necessary in the early days. The threat of invasion in 1940 may perhaps have altered this to a degree, but that event fortunately was forestalled by the famous "Few" of the Royal Air Force in the Battle of Britain over the English Channel and North Sea. The Pattern '17 remained in service with the Local Defence Volunteers ( or "Look, Duck and Vanish" as they were unfairly labelled) and the renamed "Home Guard" until their disbandment close to the end of the War. Many of these rifles subsequently found their way into civilian ownership as highly economical and effective target rifles, but large numbers of the rifles had also been issued to Commonwealth countries' forces in WW11, in addition to those used by the free French and Dutch contingents, and even the Chinese Nationalists who utilised the U.S. Pattern '17. Altogether a remarkable history, with a conclusion in which numbers of these rifles were re-barrelled to the NATO calibre of 7.62mm in conversions to permit their ongoing use as target rifles in competition when the .303"and .30-06 calibres of ammunition were laid to rest. The Dallas Morning News, 2nd. June 1918. I HAVE come to New England to show you our newest machine for fighting the Germans. I do not it mean the big guns of the navy, some of which fire shells weighing two-thirds of a ton, sending them twelve miles at a shot. I do not mean the mighty steel tanks upon wheels, which go crashing over the country, beating down walls and houses and sowing death as the farmer sows wheat. Such weapons are few and they are felt only now and then in great battles. The machines I shall write of are numbered by the tens of thousands, and some of them run up into the millions. One or more of them is in the hands of almost every soldier. They form the weapons of our boys in the trenches, and they mean victory or defeat when they go over the top. These machines are the new rifles, the Browning automatic pistol, and the new machine guns. Each will furnish a story. shots to his enemy's one he can do twice as much damage. The fact that it can not jam or miss fire may mean life or death, and the same is true as to the accuracy of the flight of the bullet on its way to the mark and the force and shock with which it strikes. In all of these respects the American rifles now being made are superior to the guns of any other nation fighting in Europe . They are the most efficient man-killing rifles ever put into the hands of soldiers, and their efficiency is estimated by military experts to be greater than that of any other gun yet invented. The Germans are armed with the latest type Mauser, and the same is true of the Turks and a large part of the Austrians, although some of the latter are still using the Mannlicher. The French have been using the Lebel rifle, with a long slender bayonet as sharp as the point of a needle, and the British have the Enfield , with a sword-like bayonet, considerably shorter than that of the Germans. Our rifles are the new Springfield , made at the arsenal here, and the United States rifle, model 1917, which we are turning out by the tens of thousands a week at the great Winchester plants near New Haven and at Ilion , N. Y. The latter is a modified Enfield . It is the British Enfield, to which have been added certain special features of the new Springfield and others, which make it far more effective than the Enfield used by the British. In this letter I shall speak of it as the American Enfield. The American Enfield and the Springfield have interchangeable parts and they use the same cartridges. 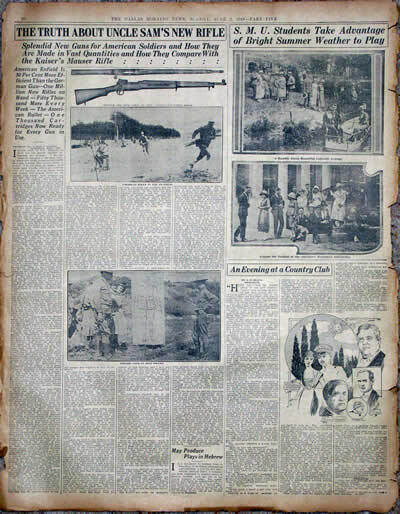 Before the war in Europe began the Springfield had won the prize in many shooting contests over the guns of fifteen different nations, defeating team after team armed with other rifles, including the Mauser. It won in the Olympic shots in 1908 and 1912, and in the latter year carried off the world's record over all other military rifles at from 800 to 1,000 yards. That record still stands. It has been claimed that the Mauser bullet has a greater velocity than that of the Springfield or American Enfield, but this, as I shall show later, is due to its cigar-shaped bullet, whose tail offers less resistance to the air, but so affects the bullet that it wabbles or turns over near the end of its flight. Indeed, the experts of our Ordnance Bureau at Washington believe that our rifles are 50 per cent more efficient than the guns of the Germans. If this is so, our soldiers can shoot three shots to the enemy's two, and every 200 Americans will equal 300 Germans. If we have 1.000,000 men in the field our guns will make them equal to 1,500,000, as far as killing power is concerned, and this means that we shall need just that many less troops and shall save their transportation, and upkeep in France . As a business proposition alone it means the saving of several billion dollars a year in the cost of the war, and more than that, considering the difficulties of transportation to France . On a peace basis it is estimated that it costs $1,000 a year to maintain a soldier, and on a war basis, such as we have in Europe, the cost must be more than five times that amount, or $5,000. If by our guns we can add 500,000 men to every million we have using rifles, the annual saving will be 500,000 times $5,000, making a total saving of $2,500.000,000 per annum for every 1,000.000 rifle shooters whom we send over the water. We are now making more than 50,000 of these new guns every week. The Springfield , which is manufactured at the United States arsenal here, has increased its production within the last year from 200 to 1,000 rifles per day, and the American Enfield, which is manufactured in our factories which made the British Enfield, is being turned out in six or seven times as great quantities. Altogether we now have more than 1,000,000 Springfields and American Enfields, and by the first of July next we shall have 1,200,000 American Enfields and 700,000 new Springfields in the hands of the army. We are steadily increasing our machinery of production, and are now making about four times as many guns as the British did a year after they entered the war, and twice as many as they were producing two years after the war began. It is expected that the monthly production will soon be 250,000. This means that we could equip an army of 1,000,000 men with rifles within the space of three months, and when it is remembered that only 50 per cent of the troops use rifles, the number of men might be doubled and we could still supply them. We have one plant at New Haven which, with its proving grounds and terminals, covers 781 acres. It employs about 18,000 hands and it fires 25,000,000 rounds of ammunition every year in testing its output. There is another factory making American Enfields at Ilion , N. Y. It is one of the oldest and largest rifle plants of the country. There is a third at Eddystone, near Philadelphia . The Springfields are being made at the United States armory here. In order to show you how the guns of our soldiers are manufactured I have gone through the great arsenal at Springfield . It is owned and operated by the United States Government, and it has been our principal gun factory since the presidency of General George Washington. An army laboratory was established here two years after the signing of the Declaration of Independence, and during a large part of the Revolutionary War this was the general depot of supplies for all the troops North of Philadelphia. The arsenal itself was established in 1794 and the first money appropriated was $59,000. The same act of Congress provided that the President should have the right to spend $340,000 for small arms and ammunition, and that the yearly expenses of the gun factory should not exceed $22,865. These figures show something as to our military expenses at the beginning of the Government. They are in striking contrast to the billions of dollars we are spending today. The buildings of the Springfield armory look more like medieval castles than factories. Some of them are almost 100 years old, and the main building was modeled after the East India House in London . The grounds altogether cover 300 acres, about one-third of this being devoted to the machine shops, which are in the heart of the city, and the remainder to the foundries and forging establishment in the United States water shop, about a mile away. The plant normally employs about 1,300 hands. It has now 4,000 ,and it works day and night. Everything connected with the army gun is made here at Springfield . Many of you have seen the rifles in the hands of the soldiers. They seem to be simple, and it is hard to realize their complicated construction and the careful workmanship required in their making. The new Springfield has ninety-three parts, ranging in size from screws not bigger than those of a watch to the tubular barrel of rifled steel, which is more than twenty-six inches in length. One of the most important parts of the gun is the bolt used in the firing. This is of nickel steel, and it is stronger than that of any other gun now in use. It has to be so carefully made that 120 different gauges are required to test its accuracy. The gun of the latest model is a little over forty-six inches long, and without the bayonet it weighs just ten pounds and five ounces. The stock is made of well-seasoned walnut wood, brought from the forests of the Middle West , and the metal is of the toughest of steel which is forged, hardened and tempered to resist the enormous shock of the firing. The gun barrel, for instance, must withstand a pressure of twenty-five tons to the square inch. The huge army tanks, which have been running about over the country to stimulate subscriptions to the Liberty loan, do not weigh much more than that, and you could balance one of those tanks on any square inch of the gun barrel and it would not affect the steel. The gun is loaded with metal clips, each containing five cartridges. It takes but an instant to throw in a new clip. It has sights made to the accuracy of an astronomical instrument, and the whole is a combination of mechanical wonders. The bayonet weighs just two ounces over one pound. It is a short sword with a point like a needle, and of steel so tough that it will cut a cent in half if wielded just right. The bayonet is so accurately made that it can be put in or jerked out of the gun with a twist of the wrist, and still it is as tight as though it were a part of the barrel. I began my visit to the factory at the water shop, going through one vast room after another, where the forgings, brought from the steel plants of different parts of the country, are pounded into shape by enormous hammers run by electricity. These hammers knead the steel, as though it were so much dough, into the parts required for the gun. A bayonet, for instance, will start into the forge as a square bar an inch thick and perhaps two inches long. It will be laid red hot under the hammer and pounded into the long, thin knife which forms the end of the gun. The hammer is directed by a mechanic, who lays the hot metal under it and sees that it shapes the bar into a bayonet. It is the same with the barrels. They start in as red-hot billets and pass through steel rollers, which make them longer and longer until they come out in round bars a little longer and thicker than the barrel of the gun. They are cut off to just the right size, and are then run through other machines which press them to the cylindrical shape of the barrel. After this they must be ground, smoothed and polished, and the holes are bored through them with electric steel drills. In this work the machine remains stationary and the machine whirls the barrel around against the drill until the hole is bored through. Then comes the rifling. This is done by automatic machinery, which runs back and forth through the barrels cutting the grooves that give the bullet the twist as it whirls or bores its way through the air. In other departments I saw them grinding and sharpening the bayonets, and in others they were testing each bayonet to see that it would slip on and off the barrel of the gun with the least possible exertion on the part of the soldier. The bayonets are tested as to the quality of the metal in them by tapping each against a piece of steel. The man knows by the ring whether there is any defect. It is just like testing counterfeit dollars. If the metal is not right the sound is dead, and the bayonet is thrown to one side. In another place I saw them tempering the parts of the gun. Everything must be hardened to just the right degree, and much of this is done in baths of boiling chemicals. Some of the parts are dipped into a cherry-red mixture of salt, cyanide and soda ash. They come out red hot, and are then dropped into a tub of oil, which boils with the heat of the metal. Other parts are put into a furnace in a crucible filled with bone ash. The bone ash is largely carbon, and some of the carbon in the ash goes into the outside of the metal, making it harder and less easy to rust, while the inside remains as tough as it was before treatment. I do not pretend to understand the science of gun making, and I will not try to describe the various processes I saw during my trip through the shops. I will say only that the making of the guns for our soldiers as a business which requires extraordinary skill, and in which everything. is measured and tested to the thickness of a baby's hair. Every bit of metal used in the guns is inspected by the Government through chemical and physical analysis before it comes here, and the parts are tested again and again as they go through the shops. The machinery required has to be manufactured by expert tool makers, and there must be thousands of duplicate gauges and other machines to equip the plants for large production. I went through shop after shop where men and women were measuring each of the ninety-odd parts which go into a gun, and I was told that the gauges have to be watched lest they become worn and do not register accurately. Some gauges require replacing for every 4,000 or 5,000 parts tested, and others do not become inaccurate until after double that use. In testing the barrels the guns are put into a frame work at one end of a long shooting gallery and high-pressure cartridges are shot through them into banks of sand at the end. The least defect causes the rejection of a barrel, and accuracy of bore as well as strength of metal is required. In some places the metal of certain parts is tested by the falling of a ball upon it. Some of the most careful work in making the gun is on the sight, which is of such a design that the soldier can draw a bead on the enemy much more quickly than the enemy can get the drop on him. The sight is nearer the eye than in the Mauser. It has a large "open peep," through which the eye easily looks and automatically centers itself while aiming. It can be adjusted to the wind, and foreign rifle experts, accustomed to their own weapons, have been surprised by the better shooting they could do with the Springfield on this account. The American Enfield is sighted for about 1,200 yards, and the only thing necessary to change for greater distances is to elevate the rear sight. We are turning out cartridges for these new guns in vast quantities. We have made already more than a billion, or enough to furnish 1,000 for each of the million guns now in use. The cartridges for the rifles fit equally well in our machine guns and the bullets are exactly the same. The bullets are made on scientific principles and with a careful study of the work they have to do. The type used is just about an inch long, and with the brass case containing the powder it forms a cartridge three and one half inches in length. The bullet has a sharp point like that of a pencil, and if you will imagine a well-sharpened pencil of polished brass an inch long you may have a picture of one of these bullets as it lays before me. It is composed of a core of lead and tin composition, inclosed in a jacket of copper nickel. It weighs less than one-third of an ounce, and it takes only one-third of its weight in smokeless powder to fire it. The bullet is pointed in order that it may easily cut its way through the air, and for the same reason the surface is as smooth as that of a new wedding ring. The resistance of the air is one of the great problems in the flight of projectiles. As the bullet goes forth from our new guns it has a speed of more than a half mile a second. For the first few hundred yards it travels at the rate of 1,500 miles or more per hour. It goes sixty times as fast as the fastest Atlantic steamship, and it has the same pressure from the air as if it were standing still with a gale of 1,500 miles an hour blowing against it. A gale one- tenth that strong will blow down buildings, and the bullet has to bore through or against that enormous pressure. For this reason the point must be sharp, the surface smooth and the whirling motion must aid in boring its way so rapidly on to its mark. The French bullets have sharp points and tapering ends, and the Mauser bullet has been pared down at the rear end by the Germans in order to reduce the resistance of the air. Our experts say that this clipping off the end of the Mauser bullet gives it a little greater speed than our bullet, but it reduces its efficiency in that it does not go straight to the mark. The Springfield bullet goes straight or makes just the curve that the man who shoots it directs. The German bullet begins to wabble shortly after leaving the rifle, and when it starts on its downward course toward its victim, instead of whirling on its axis and traveling straight, it is liable to turn end over end and be deflected by every wind that blows. Both the Springfield and the American Enfield have proved wonderfully accurate at from 1,200 to 1,500 yards. 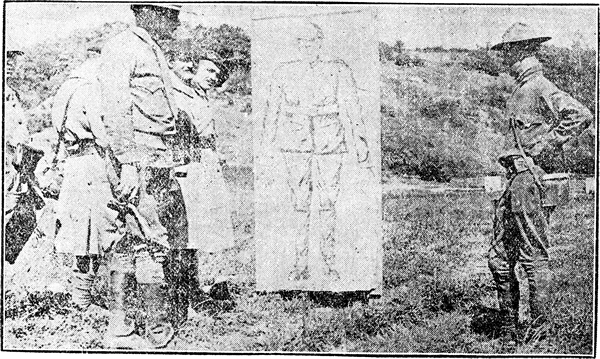 There is a deal of science in firing a gun, and our soldiers have to be taught just how high to shoot according to the distance of the enemy from them. There is a pull of the bullet toward the earth caused by gravity, and the aim has to be high above the head of the man you intend to hit if he is any great distance away. This is controlled by the sight of our new guns, which can be so set to correspond to the distances the men have to shoot. It is estimated that the bullet falls from the line it is shot at the rate of sixteen feet the first second, and that the rate of fall rapidly increases. Let us suppose the bullet will fly 2,000 feet the first second and that the man is shooting at an enemy that far away. He will then have to sight almost sixteen feet above the head of the enemy in order to hit him. If the man is a mile away he will have to figure for the gravity fall of that mile and elevate his gun to the angle which in one mighty curve will send the bullet straight to the mark.